Macroinvertebrates are small organisms without a backbone. Some common macroinvertebrates found in wetlands are: dragonfly nymph, worms, snails, beetles, leeches, mayflies, caddisflies, small crustaceans and other insects. Invertebrates are commonly and widely found in many types of wetlands. Invertebrates respond with a range of sensitivites to many kinds of pollution, for this reason they are commonly used in toxicity testing to develop water quality standards. Many aquatic invertebrates complete their life cycles in wetlands, so they are exposed directly to the physical, chemical and biological conditions within the wetland. Invertebrates with longer life cycles such as dragonflies, may signal that conditions remained healthy for the duration of their development. Aquatic invertebrates are important in wetland food webs for wildlife. 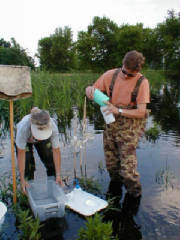 Volunteers collect a bottletrap sample.